If liquid water exists on the surface of Mars, it is most likely in the form of a briny mixture with magnesium chlorate salts, according to new experiments based on discoveries previously made by NASA's Phoenix and Viking landers, as well as the Curiosity rover. Scientists at the Department of Earth and Space Sciences at the University of Washington, Seattle, studied mixtures of water with salts known to exist on Mars, to figure out which were most likely to be liquid on Mars' surface. The experiments compared the vapor pressure and water-absorbing ability of the salt solutions. The results suggest that water mixed with magnesium chlorate would be less likely to evaporate or freeze on Mars compared with water mixed with sodium or potassium chlorate. The findings will be presented in the September 2018 issue of Earth and Planetary Science Letters. The 'triple point' of a substance is the temperature and pressure at which it can co-exist in all three phases: gas, liquid and solid. For water, the triple point is found at 0.01 degrees Celsius (32 degrees Fahrenheit) and 6.12 millibar, or 0.6% of the atmospheric pressure at the Earth's surface. In other words, one might imagine a bucket of water at the triple point, where the water exists as ice floating on a layer of liquid water, with water vapor just above the ice that has sublimated or evaporated from it. The vapor that is in contact with the ice exerts a pressure on the ice, which we call the vapor pressure. Although in some equatorial regions on Mars optimum conditions can be just below the triple point of water, for the rest of the planet the temperatures are usually well below the triple point. When the atmospheric pressure is lower than a liquid's vapor pressure, the liquid evaporates. Pure water would rapidly evaporate under the thin Martian atmosphere, which is approximately 1% that of the Earth. Salt solutions, however, do not evaporate or freeze as easily, and therefore would be more likely to remain liquid on Mars. Understanding which combinations of salt and water are most likely to stay liquid could help tell us where to look for evidence of liquid water, and therefore possibly life, on the red planet. Salt solutions are hygroscopic, which means that they are good at absorbing water. Certain salts may be able to absorb even small amounts of water available on Mars. Many different kinds of salts are found on Mars, such as chlorides, sulfates, chlorates, and perchlorates. These can be found all over the Martian surface, according to data from various lander and rover missions. 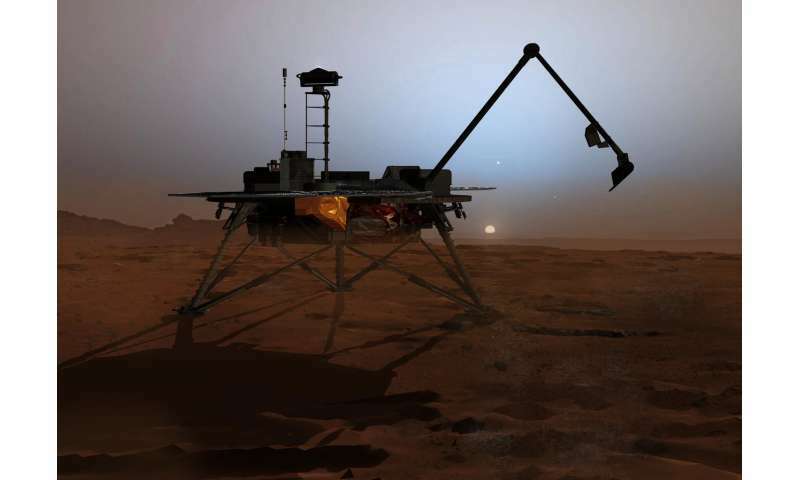 In 2008, the Phoenix lander's Thermal Evolved Gas Analyzer (TEGA), which was part of its on-board Wet Chemistry Lab, found perchlorates in soil samples from Mars' north polar region, at concentrations of 0.4–0.6%. 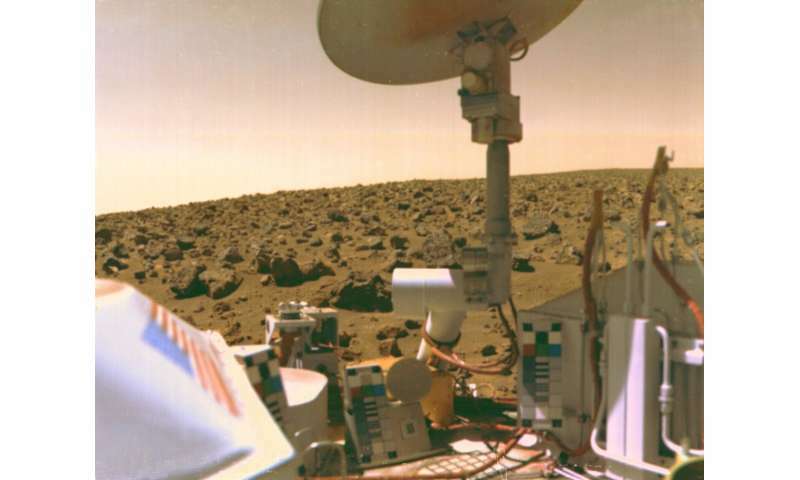 This encouraged scientists to re-analyze data from soil samples from the Viking lander missions, which took place in the 1970s. The new analysis suggested that the soil found at Chryse and Utopia Planitiae by the Viking landers contained perchlorates at a concentration less than or equal to 0.1%. Then, in 2013, the Curiosity rover's Sample Analysis at Mars (SAM)instrument found calcium perchlorate in soil samples from Rocknest, which is a spot within Gale Crater. Most recently, the Compact Reconnaissance Imaging Spectrometer for Mars (CRISM) instrument aboard NASA's Mars Reconnaissance Orbiter detected magnesium perchlorate, magnesium chlorate and sodium perchlorate within recurring slope lineae. These are streaks running downslope during the warmer Martian season and, for a time, it was strongly thought that they were produced by running water. Because of the salts, the thin atmosphere and the frigid temperatures, any such water would likely be briny rather than pure. Although results now suggest that flows of dry material somehow produce the streaks, it remains possible that water could still exist as a liquid somewhere on the surface of Mars. Which of these chlorates and perchlorates would be most likely to be dissolved in water in Martian conditions? The University of Washington's Jonathan Toner and David Catling had previously modeled data from Phoenix's Wet Chemistry Lab, to understand how different salts behave in Mars' freezing temperatures. They found that the soil samples likely containedmagnesium sulfate, magnesium perchlorate, sodium perchlorate, potassium perchlorate, sodium chloride and calcium carbonate. In theirlatest study, Toner and Catling made solutions from these salts. They found that, out of all the salt-water mixtures, the magnesium chlorate solution had the lowest vapor pressure. This means that it is least likely to evaporate or freeze and is the most likely to absorb whatever low levels of moisture are present in the Martian atmosphere. So to find liquid water on Mars, should scientists only look for sites on Mars that are rich in magnesium chlorate? "Any salts present in Mars soils will likely be as a salt mixture, so measuring the properties of these mixtures is important," says Toner. Based on the soil chemistry measured by the Phoenix lander, Toner says that sodium and magnesium chloratemixturesare most likely, whereas calcium chloratemixtures are unlikely to be found. "Chlorate salts could be much more abundant than perchlorates on Mars," Toner adds. "Our results indicate that chlorates may have an even greater ability to form water than perchlorates via deliquescence [i.e. absorbing moisture and dissolving in it] and ice melting." Could there be enough water in these brines to support microbial life? Studies of extremophiles grown in perchlorate and chlorate solutions suggest that microbes could survive in brines that may exist on Mars. A group of scientists led by Mark Schneegurt, a professor of biological sciences at Wichita State University in Kansas, USA, found that several species of halotolerant, i.e. salt-tolerant bacteria, were able to grow in high concentrations of chlorate salts. "So far, we have grown bacteria in chlorates at more than half of their [lowest melting] point concentration, [which is] what we would expect on Mars," says Schneegurt. "While we have not shown that microbes can grow at the highest concentrations needed, when we started it wasn't clear that microbes could even grow in the 0.6% found by Phoenix. We are at greater than 25% right now and going higher. We have shown microbial growth under these salt conditions and these salts are common on Mars."